Dr Rob Adam has been appointed Director Designate of the South African Square Kilometre Array Radiotelescope, from 1 April 2015. He will assume the Director position on 1 January 2016. Until recently Rob held the position of Group Executive: Nuclear at the Aveng Group. Prior to joining Aveng, Rob was Chief Executive Officer of the South African Nuclear Energy Corporation (Necsa), South Africa's statutory nuclear technology organization. He held this position from 2006 to 2012. Before joining Necsa, Rob was Director-General of the Department of Science and Technology, from 1999 to 2006. Rob has also been a Professor of Physics at both the University of Pretoria and the University of South Africa. Rob serves on the Council of the Academy of Sciences of South Africa and on the Human Resource Development Council and is President of the Nuclear Industry Association of South Africa. Rob has held various academic positions in Europe and South Africa, has published over 30 refereed articles in theoretical physics, published widely on science and technology policy and co-authored a book on science and technology in the Republic of Chile. The SKA is the most ambitious astronomy project of all time, conceptualized to deliver information about the early universe that will change how we view the cosmos from its origins to its ultimate destiny. At another level the SKA is a global bleeding edge engineering, computing and construction project located in two leading Southern hemisphere countries, South Africa and Australia. The SKA pushes the boundaries in telecommunications, computing, engineering design and construction. For example, data traffic on the system will exceed that on the entire current global internet. Phase 1 of the project is budgeted at R9 billion, and Phase 2 at least five times that amount. Rob Adam’s talk will explain how this multinational project will be funded, and the principles upon which procurement will be based. Investing countries will want their own companies to benefit, but a balance must be struck between ‘own interest’, costs and engineering systems design. Ignoring the interests of investing countries will cause them to withdraw their funding, but being ruled by these interests will drive up costs and result in systems design being distorted by technologies choices within individual packages. Tea/coffee/fruit juice and light snacks will be available prior to the lecture, with a cash bar after the event. ICE-SA (A Joint Division of ICE and SAICE) is hosting its Annual General Meeting for 2015 on Wednesday 7 October 2015 at the Bytes Technology Centre in Midrand (Map). Dr Charles Reeve is the Technical Director of CRIDF, and is a leading specialist in Integrated Water Resource Management (IWRM) with more than 30 years professional experience, of which the last 15 years have been in the SADC Region. He is a highly experienced project director, manager and team leader with experience of project preparation, management and evaluation for international bodies such as DFID, the EC, World Bank, UN and WFP. He has spent 25 years working on and managing programmes in developing countries, and has a formidable track record of successfully delivering project and programme outputs, outcomes and impact. DFID has launched a highly effective new water infrastructure programme for Southern Africa called the Climate Resilient Infrastructure Delivery Facility (CRIDF). This Facility will design and deliver sustainable small-scale infrastructure across 11 SADC countries. Headquartered in Pretoria, South Africa, the demand-driven programme focuses on water services, water resource management, and livelihoods, fostering sustainable development of the region’s water, food and energy security. CRIDF prepares small-scale water infrastructure projects and facilitates access to finance for the implementation of these projects. Such interventions provide the entry point for CRIDF to engage with, support and influence key SADC interventions, River Basin Organisations and national stakeholders, embedding climate resilient management and transboundary waters at regional and national levels. Projects are selected according to a set of CRIDF principles to ensure that investments align with SADC objectives and CRIDF priorities developed specifically for each SADC river basin. Come and learn about this innovative approach to addressing the most critical of SADC’s needs – access to clean water! 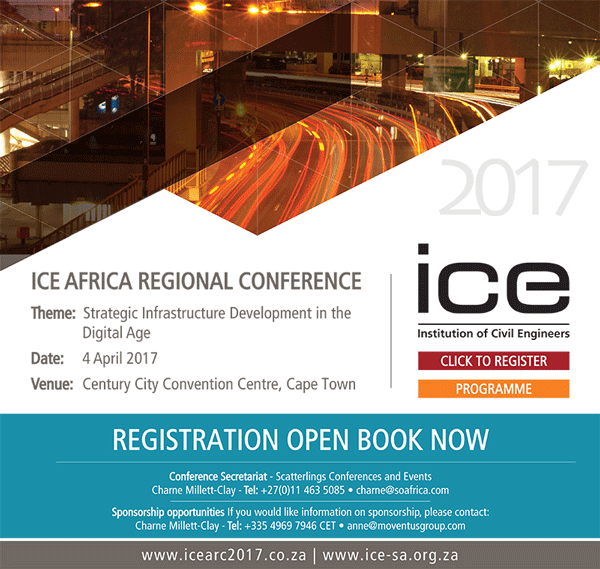 ICE-SA (A Joint Division of ICE and SAICE) is hosting its Annual General Meeting for 2014 on Wednesday 29 October 2014 at the Bytes Technology Centre in Midrand (Map). The committee calls for nominations to be submitted by no later than 27 October 2014. Should you wish to nominate a person to the committee, please download the 2014 ICE-SA Committee Nomination Form, complete, sign and fax or e-mail the completed form to the ICE-SA Secretary by no later than 12h00 on 27 October 2014. Professor and Head, Department of Architectural Engineering, Pennsylvania State University, USA. Chimay Anumba’s research interests are in the fields of advanced engineering informatics, concurrent engineering, knowledge management, distributed collaboration systems, and intelligent systems. He has over 450 scientific publications in these fields and his work has received support worth over £100m from a variety of sources. Please RSVP by clicking on the Signup link at the bottom of the page. Building Information Modelling (BIM) is a collaborative way of working, underpinned by the digital technologies which unlock more efficient methods of designing, creating and maintaining assets. BIM embeds key product and asset data and a 3D computer model that can be used for effective management of information throughout a project lifecycle – from earliest concept through to operation. BIM has been described as a game-changing ICT and cultural process for the construction sector. A number of countries globally are starting to realise the opportunities it brings and are now investing in developing their own capability. For example, the UK has embarked upon a progressive programme of mandated use of fully collaborative Building Information Modelling for Government projects by 2016. ICE-SA (A Joint Division of ICE and SAICE) is hosting a lecture series during 2014. The afternoon seminar will interrogate the use of the NEC suite of documents in South Africa, and will provide insight into the ways in which this straightforward contract suite can be used for both simple and complex projects. Andrew Baird is one of the authors of the NEC suite, and will provide insights into how contracts have been made complex and how to avoid this. The lecture will be followed by a panel discussion with current users of the NEC suite from the perspective of both the Employer and the Contractor. If you are using the NEC, or are considering its use, then this is the ideal opportunity to find out how to make it work for you!